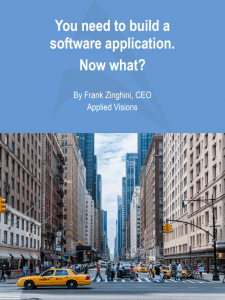 Application and Cyber Security | Applied Visions Inc.
You need to build a software application. Now what? What should you do? How should you do it? What should you look out for? This guide will help you spot the most common pitfalls and avoid them. Advice you won’t find elsewhere. Applied Visions Inc. was founded in 1987 by Frank Zinghini. Since then, we’ve grown into a family of companies, including Jybe Mobile and Software Design Solutions. We blend our substantial experience in software development with our knowledge of how to make an application that actually makes money. Data breaches have occurred with startling frequency in recent years, and many formidable institutions have been victims of cyberattacks. Applied Visions Inc. specializes in data security, and every application we work with is tested rigorously against every conceivable threat. We have even developed a suite of application testing tools that are used by other developers all over the world. Whether you want to build a new application or secure an old one, our team of experts understands the technology and danger involved, and we can make sure that your data— and, just as importantly, your customers’ data— is protected. Download security apps. We recommend Defenx Security Suite or the Max security app for iOS. Double-encrypt your passwords and use tougher passwords to crack. Don’t connect to the free Wi-Fi networks to do any sensitive work/browsing. You never know when there is a hacker sniffing the network for people on Wi-Fi. Connect via VPN, either from work or through an app such as secure wireless for Android: https://play.google.com/store/apps/details?id=me.disconnect.securefi. Be cautious of any “free Wi-Fi” in a well-populated area. You don’t know anything about the network, and it could be a hacker using their own access point. Once you’re connected to it, your phone becomes part of that network and they can see anything they want from within your phone. So stay away from any plainly named hotspot such as “Free WiFi” that doesn’t require a password. If serious about security, and ready to build an application that follows best practices in protecting data, then we’re ready to make that happen. We make a point of building security into our applications from the very beginning. It’s a top priority for us. If you’re interested in cyber security, please call us at (631) 759 3900. We can’t wait to get started. A division of Applied Visions, Inc.